Halal restaurants can be difficult to find even in a multicultural country like Singapore, especially when you’re looking for more than just the traditional Indonesian or Malaysian fare. Fret not, here’s a list of the best (and our favourite) places to get halal food in Singapore, no matter what cuisine you’re looking for! Who doesn’t like Japanese food? 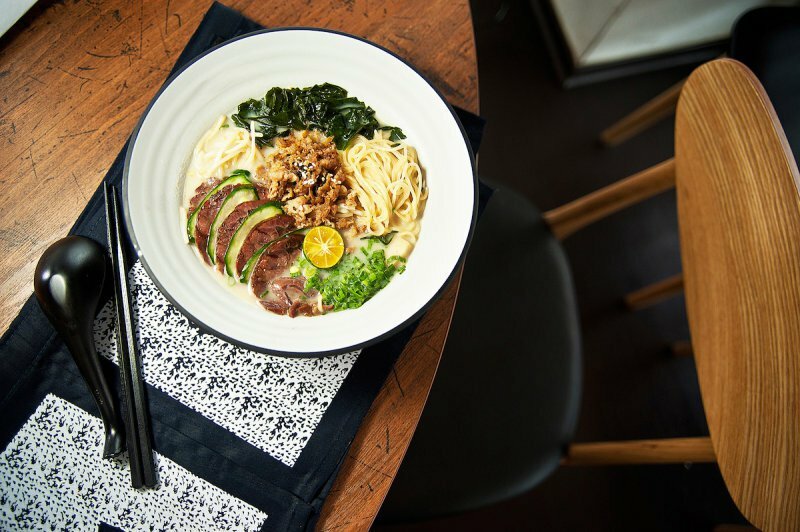 It’s the top searched-for cuisine on Chope, and for good reason: nothing is as satisfying as slurping down a hot bowl of ramen on a rainy day, or digging into fresh sashimi atop a bed of tasty sushi rice. Here’s where you can get your fix! The Ramen Stall serves up delicious ramen in a hearty chicken-based broth instead of the traditional pork-based variety, but this doesn’t make it any less tasty! Their Volcano Ramen’s a hot favourite, consisting of chicken cha-shu, corn, braised onsen egg, seaweed, bamboo shoots, mushrooms, and a mix of red chilli and dried Indian chili padi. It’s definitely not for the faint of heart (or stomach)! Hei Sushi is Singapore’s first ever halal sushi-belt restaurant, and offers a plethora of sushi and sashimi dishes at affordable prices, but if you feel like kicking things up a notch, head over to Santaro by Gion for amazing omakase! Omakase is a Japanese phrase that loosely translates to ‘I’ll leave it up to you’; essentially entrusting the chef to come up with an assortment of sushi, sashimi, and various other delights as opposed to ordering it à la carte. Upscale halal Japanese restaurants are few and far between, but Santaro by Gion is bound to satisfy all your cravings! I’m sure you’ve heard of this one before, but if you haven’t, head down to one of Tang Tea House’s four outlets for superb halal seafood (fried beehoon with crab, anyone?) and dim sum, amongst many others! Kowloon Express also has delicious Hong Kong-style food – you can’t go wrong with classics like crispy Roast Duck, Beggar’s Chicken, and Hong Kong Seabass. YUM. If you thought K-Pop was South Korea’s greatest export, you thought wrong… Because nothing beats sinking your teeth into crispy (yet juicy) Korean Fried Chicken slathered with soy garlic sauce (or yangnyeom-style if you can’t get enough spicy food!) Get your Fried Chicken, Seafood Jjamppong, and Bingsu fix with JINJJA Chicken – halal certified, and 100% delicious. Is this post really complete without mentioning Fika Swedish Cafe & Bistro? It’s a hot favourite, and for good reason: their homemade meatballs are to die for, and their extensive menu has everything from premium Black Angus Sirloin Steak to Pickled Herring Platters (served with hard rye crispbread, decadent caviar spread, and dill mayo). What else could you possibly want? You can’t go wrong with Thai food, and Koh Nangkam is well-known for their amazing Thai Milk Tea, toothsome Pandan Chicken, Mango Salad, and Clear Tom Yum soup. NaNa Thai Restaurant at Far East Plaza also serves up delightfully sinful and tasty goodies like Green Curry, Pineapple Fried Rice, and the ever -popular Pad Thai. While it’s not fine dining, the food more than makes up for any service or ambience deficiencies. It’s sweet, spicy, sour, salty, and aromatic – just the way Thai food should be! If you’re looking for a hearty, comforting bowl of Pho, look no further: head down to So Pho for a ready-to-slurp bowl of noodles filled with tender slices of beef, and some Bánh Mì! The Orange Lantern is also a good place to stop by for some crunchy Spring Rolls and Vietnamese drip coffee. Halal and delish! Authentic halal Italian food is almost impossible to find, but here’s one that’s helmed by a Muslim Italian chef – Kucina Italian Restaurant serves up delicious pizzas, pastas, and most importantly, a plethora of Italian desserts like Ricotta Siciliana and Panna Cotta! Their signature Carbonara is made the traditional way (with egg yolks and parmesan), but with turkey bacon instead of pancetta -a must-try for sure! Fancy some lip-smacking street-style tacos? Afterwit Mexican Taqueria’s amazing Chicken Tacos come with freshly made pico de gallo, guacamole, purple cabbage slaw, and sour cream, placed neatly alongside crispy corn chips. Even if tacos aren’t exactly your thing, fret not – head down for phenomenal burritos, quesadillas, and nachos… All stuffed to the brim with deliciously fresh ingredients!